Spring is beginning its “march” across the nation, and in typical fashion the month started out with the promise of pleasant weather but is throwing a few tantrums before giving way to April. For most folks in the lower Midwest, spring began a week or so ago when daffodils began popping up from nowhere and dotting the suburban and semirural landscapes with their yellow smiles. Forsythia are also set to burst forth, their appearance temporarily put on hold by this latest cold/wet snap, but when they do most people here will be satisfied that spring has finally come. For me, spring comes much earlier, and it’s not planted ornamentals that mark its beginning, but native trees. Silver maples (Acer saccharinum) and American elms (Ulmus americana) are first, bursting open in the very first warm days of early March. These are followed by the sugar maples (A. saccharum) and red maples (A. rubrum) that are in full bloom now, which will themselves give way to the redbuds (Cercis canadensis) and serviceberrys (Amelanchier arborea) that will close out the month before flowering dogwood (Cornus florida) dominates the area’s understories in April. There is one tree in this part of the country, however, that shows its amazing blooms in January and February while winter’s grip is still strong. Ozark witch hazel (Hamamelis vernalis) is restricted to the Ozark Highlands of Missouri and Arkansas, where it grows along the rocky creeks and streams that dissect this ancient landscape. I have long wanted to see its striking blooms, but despite my many wintertime hikes throughout the Ozarks, I have never found myself in the right place at the right time – until a few weeks ago when I hiked the Mina Sauk Trail at Taum Sauk Mountain State Park. I found these plants growing below Mina Sauk Falls and along Taum Sauk Creek below, and even though it was the first weekend of March (and the very first warm day of the season), many of the plants had already passed their peak bloom. Fortunately, I was able to find these several plants with flowers still in good shape. 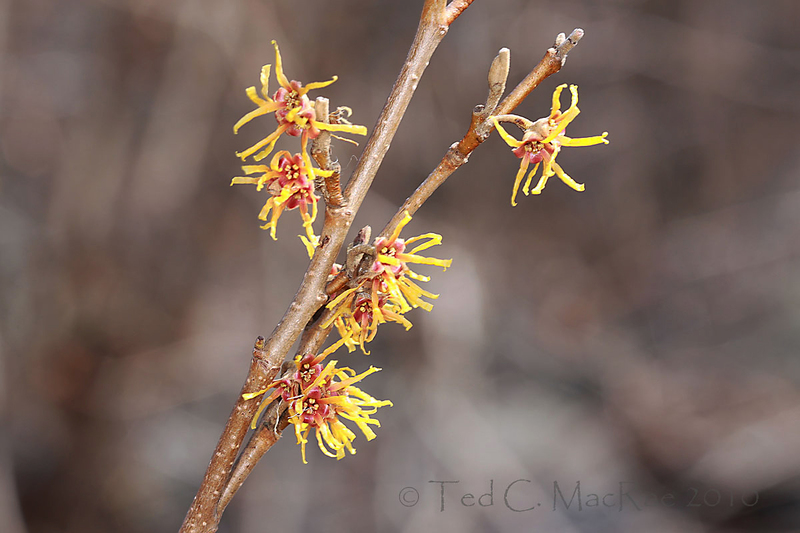 There is only one other species in the genus – eastern witch hazel (Hamamelis virginiana). Although distributed widely across eastern North America, it is restricted in Missouri to these same St. Francois Mountains where I saw H. vernalis. The two species are very similar by the characteristics of their foliage but can be easily distinguished by floral characters. Hamamelis virginiana blooms in fall rather than winter, and its flowers, while nearly twice the size, rarely show the amount of red on the inner calyx that is seen in this species. Hamamelis vernalis flowers are also quite fragrant, having what has been described as a “vanilla” scent. 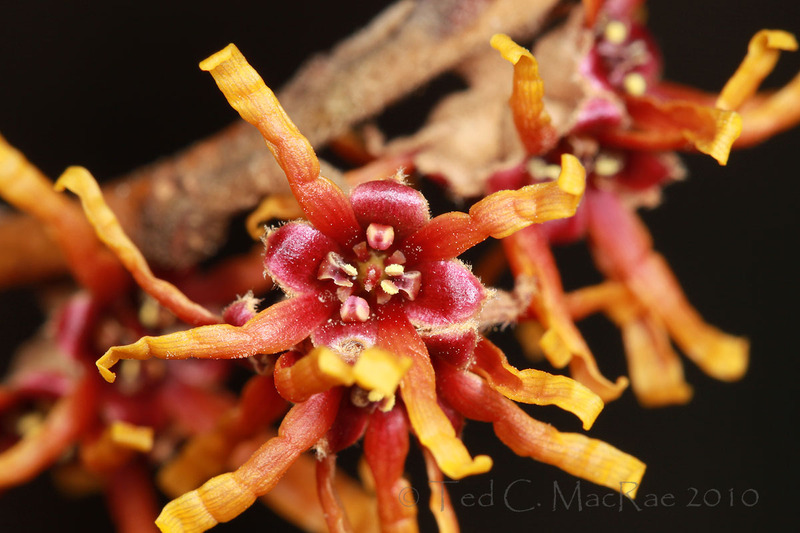 The photographs here show the rather unusual color range of the flowers of this species, which can vary from orange to deep red to deep yellow. I suspect that flower color also changes with age, in that petals are initially deep red and later fade to yellow, as in the photo below. It’s difficult to explain why H . vernalis is restricted to the Ozark Highlands while H. virginiana occurs so broadly, but the Ozarks are a well-known refugium for a number of other plants and animals, especially Ice Age relicts. Sitting on a rhyolite ledge overlooking Taum Sauk Creek as I ate lunch, I wondered about the pollination biology of a plant that flowers during winter. It was a warm day – certainly an unusual occurrence during the period in which this plant flowers – and even still it was too early in the season for a lot of insect activity. I watched one of the nearby plants as I ate to see what insects came to the flowers, and for a time all I saw were a couple of European honey bees. Clearly, the plant did not evolve in association with this now ubiquitous insect. I continued watching, and at last I saw a native insect visiting the flowers – a large species of hover fly (family Syrphidae), perhaps something in the genus Helophilus. After taking a few more photographs (unfortunately, none of the fly), another of the same species visited the plant. Flies in general are famous for appearing during warm days in winter, and I wonder if the unusually extended bloom period of this species is intended to take advantage of those few, unpredictable days during winter when temperatures are sufficient for flies to become active. Photo 1: ISO 100, 1/200 sec, f/11, MT-24EX flash w/ Sto-Fen-Puffer diffusers. Photo 2: ISO 200, 1/200 sec, f/5.6, ambient light. Photo 3: ISO 100, 1/60 sec, f/9, flash w/o diffusers. Photo 4: ISO 200, 1/250 sec, f/5.6, ambient light. This entry was posted in Hamamelidaceae, Plantae and tagged Botany, Missouri, nature, science, trees, wildflowers. Bookmark the permalink. That would be awesome – I really was unable to find anything but general references to insects as pollinators of this species. I’ll send a copy over to your email – not sure how to attach through this thing… I made a closeup crop so you can find it. It’s not on the flower, so maybe it’s not doing any pollination for the plant. Who knows? It’s not a great shot of the beetle. Remember, I was just taking a picture of the flowers and didn’t even know the beetle was there! Attractive and strange, or maybe it’s the other way around. Nothing even vaguely similar hereabouts (Alberta), and no sign of spring to speak of either. 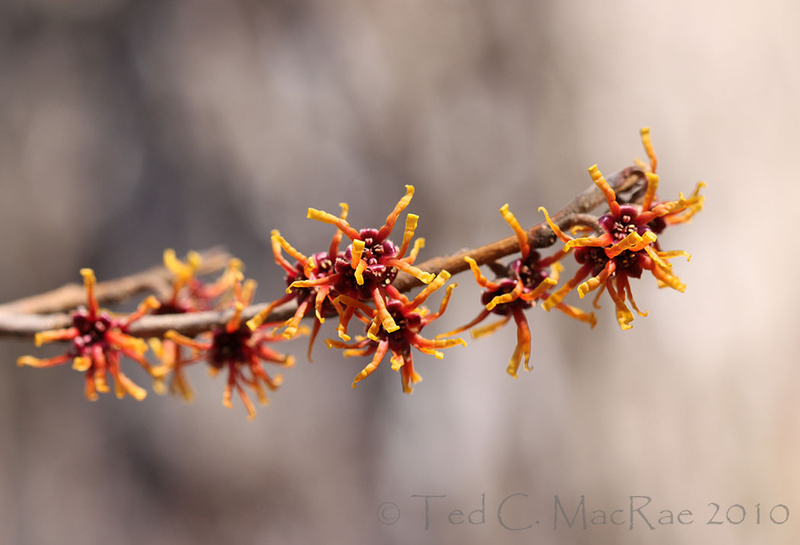 But, I remember the other witch hazel and its very late and wispy flowers – and also the tincture that my grandmother had on hand for scratches and bug bites. If I ever thought about it, I would have wondered if given the season, the lack of leaves, and the very open flowers, if common witch hazel wasn’t wind pollinated. I would wondered that for your vernal species too, although the colour and scent argue for insects (although could be a mixed strategy too). 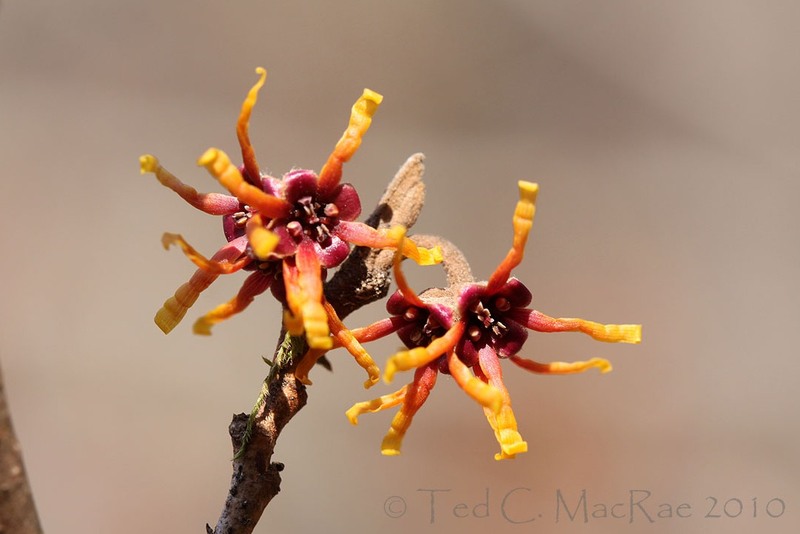 However, there is a wittily entitled recent (2002) paper “Many to flower, few to fruit: the reproductive biology of Hamamelis virginiana (Hamamelidaceae)” in the American Journal of Botany (89(1): 67–78) by Gregory Anderson and James Hill. Anderson and Hill were interested in why witch hazel flowers so late in the Autumn, but found quite a few insects, especially flies, and among the flies fungus gnats in the genus Bradysia (same genus as commonly infests house plant pots), and also bees, beetles, etc. visiting the flowers and carrying pollen. I couldn’t find anything on H. vernalis except one study of the pollenkit in German and starting with the impressive word ‘Entwicklungsgeschichte’. All I could garner from the English abstract is that the pollen is sticky and likely insect transmitted. A paper I can’t access – Li, Bogle, Klein, and Donoghue. 2000. Phylogeny and biogeography of Hamamelis (Hamamelidaceae). Harvard Papers in Botany 5: 171–178 – may have an opinion. Good stuff – I was hoping a good botanist would come along and provide some insight on the pollination. I’ll see if I can access any of the references. Well, it helps to spell it right, then it’s more easily pronounceable :): Entwicklungsgeschichte. Yes, that would apply nicely to the development of beetle larvae. Dave – the Anderson and Hill paper makes reference to a study in the Ozarks by Bradford and Marsh (1977), who observed that in unusual years when the flowering times of H. virginiana and H. vernalis overlapped, there was a strong pollinator preference for H. vernalis. Any chance you have access to this paper? Bradford J. L. and D. L. Marsh. 1977. Comparative studies of the witch hazels Hamamelis virginiana and H. vernalis. Arkansas Academy of Science Proceedings 31:29–31. Of course, the study was conducted late November through December during a brief period of overlapping flowering by the two species. More interesting would be a survey of the potential pollinators during the January-February peak bloom period of H. vernalis. Speaking of the “pronounced fragrant [sic] of H. vernalis flowers”… Did you notice a fragrance while photographing? Everything I’ve read says the blooms have a strong smell, but ours seem to be scentless. No, I did not notice a fragrance either, but I figured it because it was near the end of the bloom period. Have you “smelled” them during peak bloom? Ted – Thanks for visiting my Blue Jay Barrens blog and leaving the information on the bark beetles. I’ll keep an eye out this summer and see if I can catch some in the act. Your welcome, Steve. Thanks for visiting. Thanks, Marvin – I’ll be interested in seeing them. This winter pollination thing has gotten into me a bit, as all my literature searches have so far failed to turn up anything specific about this species. We have some planted here at SNR. Come see it! I’m sure the blooms are well past their prime now, eh? It doesn’t surprise me at all to see a host of flies and maybe bees popping up on these flowers during warm, late winter days, but I’m intrigued about why they’re flowering in January (or even late December, from what I gather) – there must be something out during that time – at least on certain days – to select for that. If it was only the late winter/early spring insects that it relied upon that would seem to drive a shift towards later flowering. Actually, it seems that virginiana is the only non-winter flowering species in the genus – the two (I think?) Asian species and another recently described US species (name escapes me) all flower in winter like vernalis. Maybe that’s why virginiana is so widespread across the eastern US – it found a better time to flower with a better pool of potential pollinators.